Ever since the passing of the Iranian master Abbas Kiarostami, I've found myself remembering the brief personal memories I have of him. They were all very fleeting. Merely that Ming Jin and I, along with Fooi Mun, our The Tiger Factory lead actress saw him at the MK2 party and had to hurriedly (and politely) stop him to take these photos before he was about to leave. Fooi Mun had actually met Abbas a few months earlier, when she was at the Marrakesh International Film Festival (Charlotte Lim's My Daughter, which she starred in, was in competition, they ended up winning a Jury Award). The next day Fooi Mun and I attended the afternoon screening of Kiarostami's Certified Copy. that was the first time I've ever seen his film on the big screen. That was one of my fondest memories of Cannes Film Festival 2010. 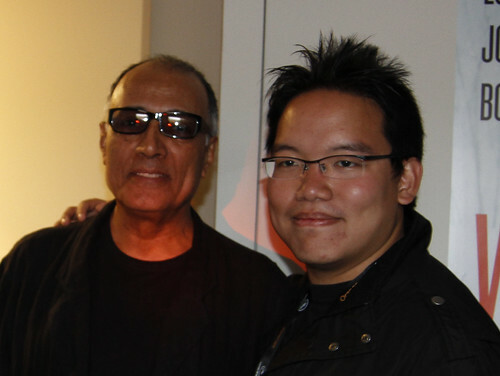 When I met Kiarostami again, it was at the Busan International Film Festival 2010, a couple of months later. I never got to interact with him, but he was the dean of that year's Asian Film Academy. I was at their "Graduation screening", and I got to watch him give a speech. At the awards ceremony when I walked off the stage after winning the Sonje Award for Best Asian Short Film, I walked off the stage, a little flustered, but also trying to hurry and get the hell away as quickly as I could before the "Main Event", when the feature film awards were given to the New Currents Competition directors. Kiarostami was seated at the front row, clapping his hands, looking directly at me. "Congratulations!" He mouthed. "Thank you!" I think I mouthed back, spoke, or yelled. Until this very day, he was the only person among the audience whom I remembered. Everything else was a blur. That was the last time I saw him. The next day, dad flew from Busan to Seoul while I returned to Tokyo. Dad called me after he landed in Seoul: "Hey! I was on the same flight as Kiarostami!" We always seem to remember Kiarostami with joy. To rectify this, I decided to do a mini-marathon of Abbas Kiarostami films (if watching one film every other day can be considered a "mini-marathon"). I started with Close-Up, followed with Through the olive trees, then Life, And Nothing More (in retrospect, I should have watched Life, And Nothing More first, followed by Through the olive trees, in order to maximize my enjoyment of his beloved Koker Trilogy). and then I watched Wind Will Carry Us and Ten. Like most times when I were sampling (binge-ing) the works of the masters, the entire experience had been a tremendous delight, and inspiring. I loved how he daringly blurred the lines between truth and fiction, between documentary and drama, in his exploration of human emotions. Yet the poetry of his films (I remain haunted by the ending of Through the olive trees and many moments of Wind Will Carry Us). I was so inspired that I managed to even revamp and figure out a script that I have been struggling to write. I was stumped for months, and a few days of watching his films allowed me to rewrite an entire treatment in a day. That's the power of great cinema. That's the timelessness of greatness. I cannot really imagine living a life where you measure films as if they were a trend, that a film that came out 2-3 years ago would be considered an "old" film, and then you move on to seeking other things that are in the cinema, indulging yourself in things that you will forget immediately after the credits are rolling. Poetry is forever. To rob yourself the pleasure of exploring these works from different times and different eras, I think that's one of the biggest tragedies I've ever witnessed.